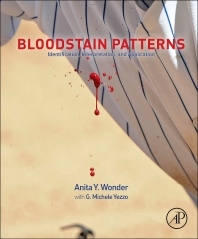 Bloodstain Patterns: Identification, Interpretation and Application combines material from Blood Dynamics (2001) and Bloodstain Pattern Evidence (2007) with updated case work and scientific advances from medical and hard sciences. The text expands coverage of such areas as arterial damage pattern identification, staging of crime scenes, legal applications and problems from both sides of the bench, and extending teaching and training to those outside criminal justice. With violent offenders more aware of crime scene investigation techniques and attempting to frame others, the text expands outdated basic training programs that are insufficient to identify attempts to confuse the investigation. This book clarifies previous understandings as well as bridges the gap toward future advance courses. Based on the work of Paul Leland Kirk, the book’s focus is on first line investigators’ accuracy in identifying specific bloodstain patterns, correctly interpreting and applying them to casework. Chapter 6. How Many Pieces of Evidence? Who is Affected by Discoveries in Bloodstain Pattern Evidence? Anita Wonder is Founder and Director of the Wonder Institute, a forensic science consulting, training and research association specializing in Bloodstain Pattern Evidence, based in Carmichael, CA. From 1971 to 2005 Ms. Wonder was the Senior Clinical Laboratory Scientist for a large national HMO. She continues to lecture, handle special case studies and testify on the evidence for both prosecution and defense. Anita has testified for both criminal and civil proceedings.